Hose Bibs, or Sillcocks, are plumbing fixtures that connect a hose to a water line. Mostly used in the field to provide a water supply outlet. Their main application is in backyards and gardens so that a hose can be attached to it. Canarsee carries a range of Hose Bibs and Sillcocks from Matco-Norca and Webstone. 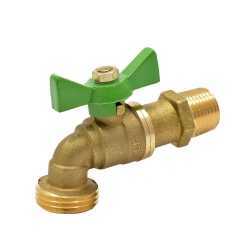 The 646R03LF from Matco-Norca is a 1/2” MIP Hose Bibb Ball Valve (Multi-Turn), Lead-Free.Featu.. The GHB012-LF from Wright Valves is a 1/2” MPT Hose Bibb Ball Valve (1/4-Turn), Lead-Free.Feat.. The 646R04LF from Matco-Norca is a 3/4” MIP Hose Bibb Ball Valve (Multi-Turn), Lead-Free.Featu.. The 646BV03LF from Matco-Norca is a 1/2” MIP Hose Bibb Ball Valve (1/4-Turn), Lead-Free.Featur.. The GHB034-LF from Wright Valves is a 3/4” MPT Hose Bibb Ball Valve (1/4-Turn), Lead Free. .. The 646BV04LF from Matco-Norca is a 3/4” MIP Hose Bibb Ball Valve (1/4-Turn), Lead-Free. .. The 30202W from Webstone Valves is a 1/2” FIP Hose Bibb Ball Valve (1/4-Turn), Lead-Free.Techn.. The 30203W from Webstone Valves is a 3/4” Hose Bibb Ball Valve (1/4-Turn), Lead-Free.Technical..